Why Choose an SWPP Photographer? The choice of a professional photographer is one of the most important decisions you will make when planning your wedding, family portrait, commercial shoot or any other special assignment. 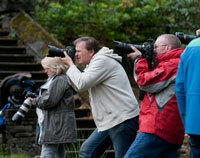 There are thousands of photographers in the world to choose from. How do you decide? This association, founded in 1989, boasts membership of only the most enthusiastic photographers who want to share their experience and build a photographic community rivalled by none. SWPP members benefit from continuous education in the field through Europe's largest Convention, regular meetings and programs, access to educational materials, and sharing knowledge with their peers. We also recommend you choose one of our qualified members. All qualified members have had their photographic work assessed by their peers and have proved that their work is of merchantable standard or much higher. Don’t forget to check they have the correct insurances in places, it advise all photographer to have at least Public Liability and Professional Indemnity insurances. Don't settle for less. Hire a photographer who is a member of the SWPP You'll be glad you did!